Arthur. 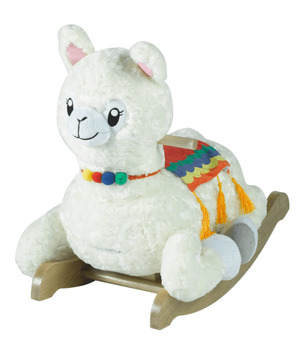 F Llama is a bright guy, both in terms of his on-point fashion sense as well as his intelligence. He's smart enough to play teacher. How? He comes equipped with four buttons on the back of his head. Push one, and Arthur F. will play an original song that teaches his riders shapes, numbers, the alphabet, and colors. As an added bonus, Arthur F. has hidden squeakers and crinkles to surprise his riders. For an extra-special keepsake, personalize your rocker! When you select personalization (11 character limit), a wood rail will be engraved then painted for a bold look. Please click on More Images above to see color options and more rocker images. Approximately 24�L x 12�W x 17�H. Made for children ages 9 months and over, up to 80 pounds. It was exactly what we expected! A little assembly but worth it.